Instead of making an entire site to show some videos about projects I've done so far, I will post it here. Much more user-friendly and compact! Most of my work was made at the USAT, during my two years of enrollment. That's where I picked up programming (so that means I've started programming two years ago! ), by making a Flash game. Which I unfortunately lost due to a human error on my FTP server. If anyone reads this: MAKE BACKUPS and not on the same server as the site itself. Pressing delete from your root folder is almost never a great idea. Anyway, back to the projects. I will show you the top 5 of the games I made that I like the most. I like this game the most humor-wise, but not code-wise. I had a lot of trouble to get the movement of the fish to work properly and the collision was a pain as well. When you were swimming, you could swim into a corner and break the collision. Which happened very often. The audio consisted of three layers. The volume per layer depended on a factor in-game. For instance the drum-layer depended on the distance between the waiter and the fish. The game was made in Unity by the way. The movement of the waiter was done by another programmer, which started as an ambitious path-finding project but became a waypoint-to-waypoint system. Garuda was a GGJ-entry of which the theme was Ouroboros. After a brainstorm that took way too much time we decided to make a game where the goal is to die and reincarnate as many times as possible. You can do that by flying in the trail the other player leaves behind when hunting for your trail. This game was made in Unity and the idea was to make it a LAN-game, but due to a lack of knowledge and time at that moment, we decided to make it 2-player splitscreen. We had problems with the movement at first, because we included the Z-axis rotation, which became incredibly confusing and annoying. We looked at Diddy Kong Racing and used the flying movement that they had. I didn't do all of the coding in this project, but I've worked on the movement, the collision trail, the GUI. Basicly everything that's left to do when using Unity. Tiny Knights was my first game made in XNA. This was also my introduction to shaders. I made a little directional light-system, made a GUI-system and made some basic gameplay. The game is based on plants vs. zombies, only simpler. The goal of this version of the game is to repel the enemy attackers until you have enough cash to be practically invincible. This is because I didn't have enough time to make a better AI and a destructible castle for the enemy. In a mission to learn C++, I made a game in SFML (SDL, only easier to use in my opinion). It's an easy game made in a short amount of time. 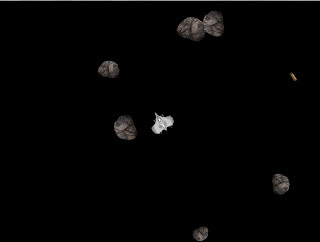 You simple shoot asteroids, they disappear, new asteroids spawn and you shoot those as well. I didn't have enough time to implement the splitting of asteroids, but that's perhaps something for the next game. Deadline: None, just started this two weeks ago. Clockwork Age is a steam-punk RPG that I am making with a friend of mine, Luc van de Mortel. I will make a level editor (as seen in this picture and on many posts on this blog) and a third-person-like gameplay. I can't give any details, because there aren't any yet. This project is made to expand our portfolio and make something awesome. We will make as much as possible before we start our study in September 2013. I use Git and GitHub to keep track of my code and to show people the code I make. The rest of my work includes lost projects(like my first Flash-game), barely working experimental games involving an installation, mostly made to create an experience more than a game. I also make websites, but I don't really find that relevant enough for a Game Programmer portfolio. I also want this to be a short overview of things that I want to show. If I finish other projects, I will make a new portfolio-post with a link to this one as well. Hi there, I am Eric Polman, a student learning the art of Game Programming. I also do some webdev, but my main focus is games. Clockwork Age - Camera controls are done!